The visual arts teach students to express themselves creatively in form and space. Student works are exhibited throughout the year in the hallways and are featured in ArtsFest, our yearly celebration of the arts in Seattle's Town Hall. Classes are taught by professional sculptors, painters, graphic designers, ceramicists, illustrators and photographers. 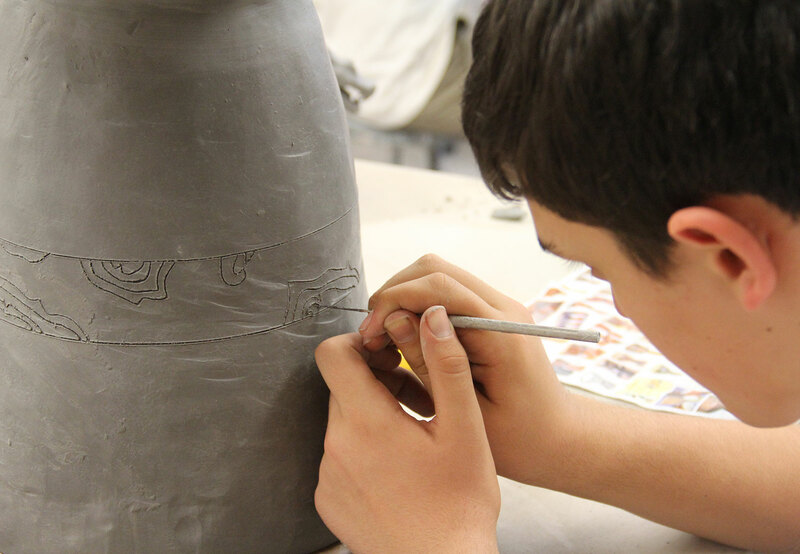 In our ceramics classes, students experiment with both ceramic sculpture and functional (useful) pottery. Student work has been selected for the National k-12 Ceramic Exhibition. 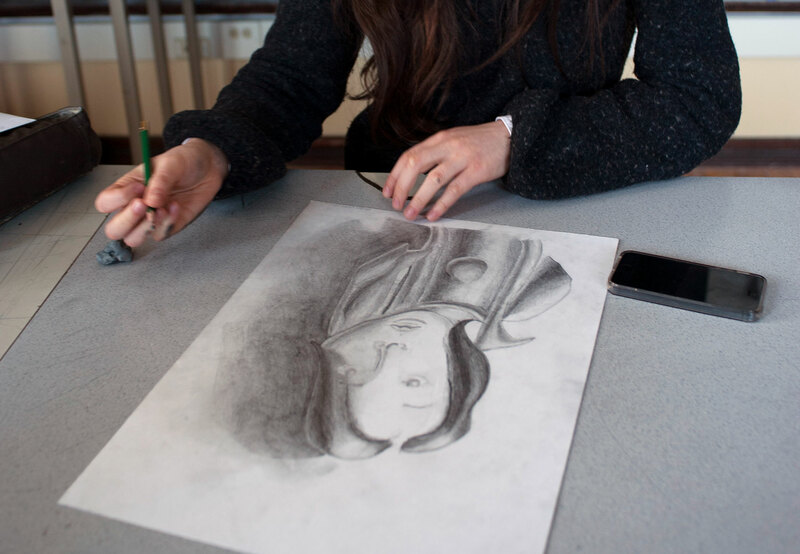 In Advanced Drawing, students sharpen their skills by drawing still life and an extended series of four in-class self-portraits. In our Public Art class, students investigate traditional and nontraditional forms of public art and engage in the debate about what is public art? The class helps students develop both a personal and public voice. Students will use animals as inspiration for making drawings, block prints, paintings, and sculptures. Working with paints, paper mache, drawing materials, wire, and other art materials, students will learn creative techniques for their art work. For inspiration, the class studies examples of animal images in art from different parts of the world throughout history. Animation liberates the imagination through the innovative manipulation of images. This course explores the creation of animation from camera-less techniques through the use of stop-motion animation via CS 6 Photoshop. Students develop and complete several animated projects using a number of techniques such as claymation, drawing, and advanced technology. Students will create handmade books using different bookbinding techniques such as pamphlet stitch, accordion stitch, and Japanese stab. The class will use needle, thread, awl, bone folder, and other tools to create one-of-a-kind books. Students will use a variety of different papers and materials and experiment with digital photography and other image-making processes. This exciting and challenging ceramics course builds on the foundation of beginning ceramics. We embark on new and different projects that encourage students to have more involvement in the direction of their work. We experiment with both “ceramic sculpture” and “functional (useful) pottery.” We often integrate new materials into our artwork, including a bit of metal, wire and melted glass. Beginning: This exciting course introduces students to a variety of ceramic sculpting techniques and also serves as an introduction to the potter’s wheel. Students gain wheel-throwing skills as well as an excellent grasp of terminology, techniques, glazing, and conceptual foundations. Projects range from simple functional cups, bowls, and vases to fabulous decorative boxes, beginning figure sculpting, abstract sculptural forms, and the unknown. Intermediate: Through hand-building and wheel-throwing, students learn many new and powerful ceramic art-making techniques. We begin by exploring the palette of glazes, including experimenting with the unique process of fusing colored glass into (and onto) the student’s ceramic art work. Using a combination of traditional and innovative techniques, we explore functional and abstract forms and focus on figurative sculpting, including realistic sculpting of a human head. What makes a good city? Is it schools, parks, shopping, or interesting architecture? Students in this class will look at all of those possibilities plus more as they make art projects inspired by questions of city design. 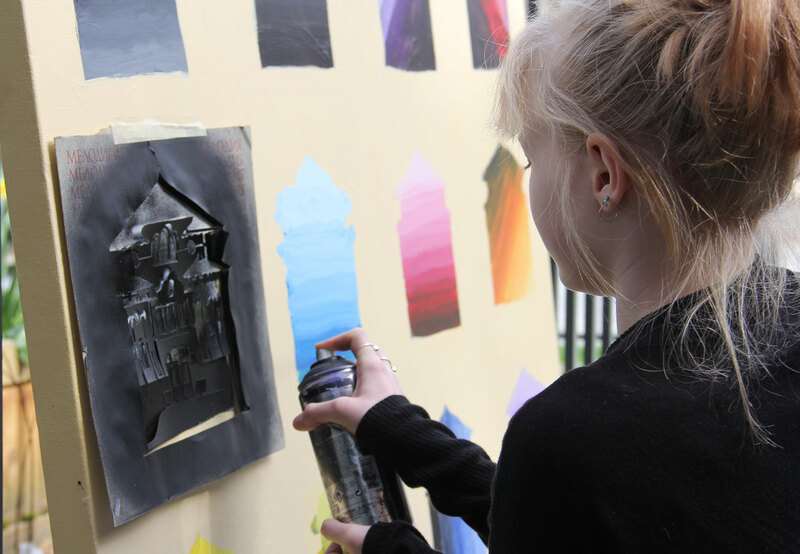 Using charcoal, acrylic and water paints, markers, paper mache, and printmaking inks, students will make maps, designs, sculptures of buildings and a collaborative sculptural city model. In this class, students explore the various techniques used to create digital art. In addition to discovering contemporary artwork being created by artists using digital media, they learn to work with digital tools and create some artwork based on their own ideas. Beginning: So you think you can’t draw? This is the perfect class for you. Students of all skill levels find this class to be helpful and inspiring. We begin with the basics: line, negative space, and proportion. Later in the year we work with value (black, white, and grays), “shading” to create a sense of depth in our work, and finally, color. Projects include still life drawing, work with scratchboard paper, and an extended series of four in-class self-portraits. Advanced: This course is an introduction to the concepts, terminology, and techniques relating to drawing as a primary mode of visual communication. Within the basic units of still life, landscape, portraiture, expressive design and composite drawing, students sharpen their ability to construct more effective compositions, record proportion and scale, and replicate the effects of light on form. In the process of speaking constructively about their own work and the work of their peers, students develop a personal voice, utilizing the language of drawing. This class teaches students about art from the ancient Egyptians. Students will write words using hieroglyphs and make a painting inspired by tomb paintings from the Pharaohs. This class will look at examples of paintings, sculptures, architecture, and writing from the time of the Pharaohs, and will work with acrylic paint, paper mache, fibers, colored pencils, and oil pastels. Students in this class create a variety of projects out of many different kinds of fibers, including fabrics, yarn, plant material, paper, and wire. In addition to learning weaving and simple sewing techniques, students study the way color, shape, and texture are used in fiber art, and examine how fibers are used in other cultures and different time periods. In the world today, students need to know how to manipulate imagery and create high quality presentations. Students in this class learn the basics of graphic design while utilizing the robust Adobe Creative Suite (Photoshop, Illustrator and InDesign). These three programs have become the industry standard for image manipulation and layout and students learn they are important technological tools of communication and support and enhance the ability to share ideas and communicate. They gain professional skills by creating materials for the benefit of other classes and departments in the school. In this class, students will explore the creation of visual images using a variety of media and techniques, some of which are very old and not often taught to high school students. Projects include working with three of the following media: encaustic (melted, pigmented wax), egg tempera (students will make paint using pigment mixed with egg yolk), drawing/painting with bleach, or full body, collaged self-portraits on cardboard. New media art is an umbrella term for artwork that is produced using a diverse set of categories such as digital art, computer graphics, visual art, and interactive technologies. Students will create new media art pieces using new and old technologies. Students will create art projects which explore a different theme or issue, ranging from the prison industrial complex to analyzing dreams. Students will learn techniques for using acrylic paint to make representational paintings, including people and pet portraits, cityscapes, and natural landscapes. Students will also learn printmaking techniques such as collagraph prints, color monotype prints, and carved relief prints. The class will look at historic and contemporary visual art examples for inspiration and will paint from life, photo sources, and imaginations, ultimately creating art that combines painting and printmaking techniques. Beginning: Introducing students to both traditional and alternative methods, this class begins by exploring the basic materials, techniques, and processes of black-and-white photography. Creative assignments enable students to increase skills in light metering, depth of field, shutter speeds, exposure, composition, and development. In addition, students study and gain a deep understanding of the history of photography. Advanced: This course is for serious students who want to pursue the creative and conceptual aspects of photography. Several weeks are devoted to ‘making images’ in the camera through five shooting assignments, including a review, still life, conceptual, and color photography. Next, students explore archival printing, alternative processes, and color inkjet printing. In addition to synthesizing ideas and collaborating on group projects, students study and discuss photographic history, contemporary concerns, social responsibility, and alternative presentations. This class will program microcontrollers to create moving sculptures and interactive visual displays. Students will learn how to use a later cutter to create 3D works of art, and will learn how to incorporate LEDs, photoresistors, temperature sensors, and potentiometers into mixed art medias. This course is about looking at, thinking about, and making art in public spaces. Parks, plazas, courtyards, sidewalks, rooftops, sides of buildings, bridges, and highway overpasses are all potential sites for projects. Students investigate traditional and nontraditional forms of public art and engage in the debate about what is public art? They take field trips to view and install their own public art projects, and work with several media (drawing, painting, sculpture) both in the studio at school and off campus. This course is about looking at, thinking about, and making art in public spaces. Parks, plazas, courtyards, sidewalks, rooftops, sides of buildings, bridges, highway overpasses are all potential sites for projects. Students investigate traditional and non-traditional forms of public art in urban sculpture, memorials, mural painting, earthworks, graffiti, video projections, performance, and Internet art. They engage in the debate about what defines public art, take field trips to view and install their own public art projects, and work with several media (drawing, painting, sculpture) both in the drawing studio and off campus. This class focuses on constructing three-dimensional art forms from a variety of materials, including plaster, wire, wood, and paper. For inspiration, students look at images of sculpture from different artists, cultures, and time periods. They also study and design strategies for building and combining shapes and structures that stand up and balance. This class explores a variety of materials used in the making of sculpture. Students cast, carve, cut, create, investigate, relate, and concentrate on the making of sculpture. Projects include casting paper, casting glass, and stone carving. Other possible materials are bronze and wood. Students learn to form three-dimensional objects with hand tools and are encouraged to create works of their own design. In this class, students will explore both traditional and unconventional drawing materials to create projects based on several unique topics that will be developed as a class. Students will look to artists for inspiration, and will be encouraged to push their own boundaries and seek creative solutions in their work, in the studio, and at home. Drawing will progress from idea to sketch; sketch to sustained drawing; individual drawing to work in a series. Formal, material, and conceptual experimentation is encouraged and necessary. Using trees as inspiration for making art work, students will connect with nature to create art in this class. This class will needle a felt tree sculpture, design a tree house and build a paper mache of it, study the paintings of British Columbia artist Emily Car, and find inspiration of ink drawings of trees created in China 600 years ago. This class teaches students the basics of Digital Single-Lens Reflex photography. Students will learn how to use their cameras to creatively capture images that document time and place as well as utilize photographic editing software to retouch and organize images. The class will culminate with the creation of an annual publication documenting the school year. This class is suited for beginning as well as more experienced artists. It focuses exclusively on water soluble media, including watercolor, gouache (opaque watercolor) and aquarelle pencils. Over the course of the year students create both non-representational as well as carefully observed “realistic” works. Possible projects include creation of an abstract watercolor collage as an introduction to pigments and techniques, an extended still-life painting, and a gouache work done in the style of Aboriginal Dot Painting.